The hardiest, most floriferous Gardenia yet, Crown Jewel is a great variety, that is only just being seen in the UK! Just as stunning and as fragrant as its indoor relative, its snowy white, waxy, star-shaped flowers completely smother its exquisite evergreen leaves from early June. 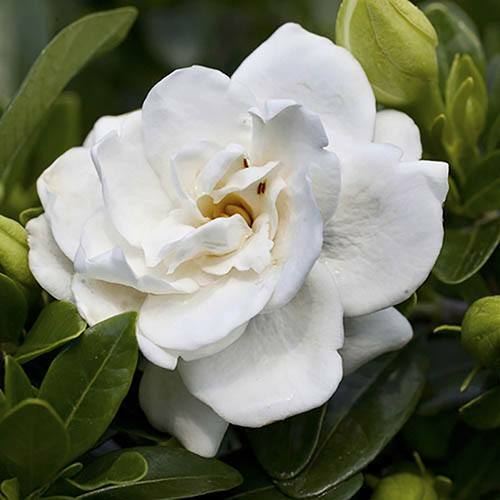 The scent of gardenias is so gorgeous its often used in perfume, so imagine sitting on your patio this summer surrounded by its intoxicatingly sweet fragrance heavenly! A beautifully compact shrub, Gardenia Crown Jewel is very easy to grow and care for. Simply plant it in a pot or garden border, preferably using ericaceous compost, and it will happily grow and flourish outdoors all year round. Supplied 2 years old in a 9cm pot.